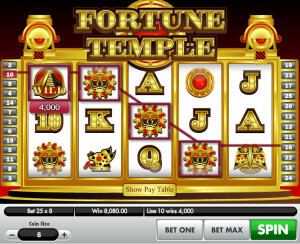 The action in Fortune Temple revolves around a long lost temple which is filled with treasures. It’s the classic South American civilization inspired game, with Mayan pyramids serving as some of the symbols. Indiana Jones is the one that made this kind of idea popular, that treasures are hidden in South American jungle covered temples, so these days there are a few dozen slot machines with a similar theme to this one. There is a lot of gold used in the design, but that’s not the problem with it. It’s the dated look that’s hurting it, as you can see yourself. It seems that it’s one of the older titles that Gamesys has launched, as there is a huge difference between this slot and the ones they released in the last couple of years. This is a 5 reel title, which manages to offer up to 25 lines for you to bet on. There are a couple of bonus games that you should take a look at, plus scatters and wilds. Top payouts here are worth $80,000. Despite the look which might not be a favorite of too many, the features are quite good, coming with a wild symbol, a scatter which gives out prizes and two bonus symbols which trigger just as many bonus games. To start with, I’ll mention the wild symbol, if for no other reason than because it is the one that gives away the biggest prizes of this game. 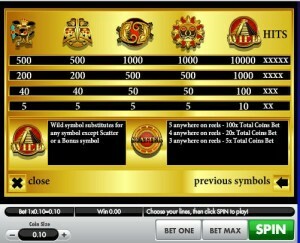 Arranged with two to five symbols of Mayan Pyramids on the same line, the wild pays as much as 10,000 coins. When not doing its own thing, it acts as a wild and substitutes for the regular symbols, so it can’t help you with the bonus games or the scattered symbols. Scatters are also present in the game, being the ones responsible for some of the more interesting action. The Scatter Logo is going to pay you money by appearing in whatever position it happens to land, the only thing important being how many symbols of this type are on the reels at the same time. Get at least three scatters, and you will win a prize which is worth between 5 times the total bet, and 100 times. 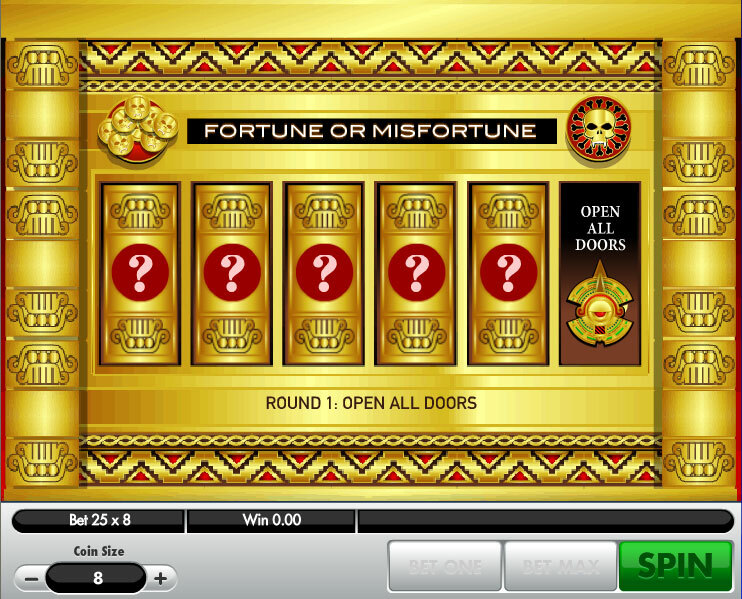 The first of the two bonus games starts up whenever the Green Eye bonus symbols occupy positions on an active win line with a minimum of three icons. You are offered a new screen, with six doors on it, where you have to choose one of them. A few different outcomes are possible here. One of them gives you a Gold Coin, which is a prize you can win. Another would be the Skull, which ends the feature. The third one would allow you to open all the doors and get all the prizes of the feature. The second bonus game is called Gift from the Gods and it starts up with the help of the Red Eye symbol. 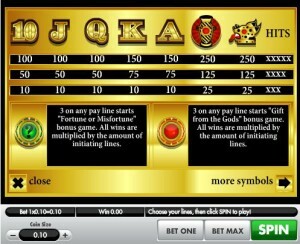 3+ bonus symbols are needed on an active line, before this bonus game starts up. 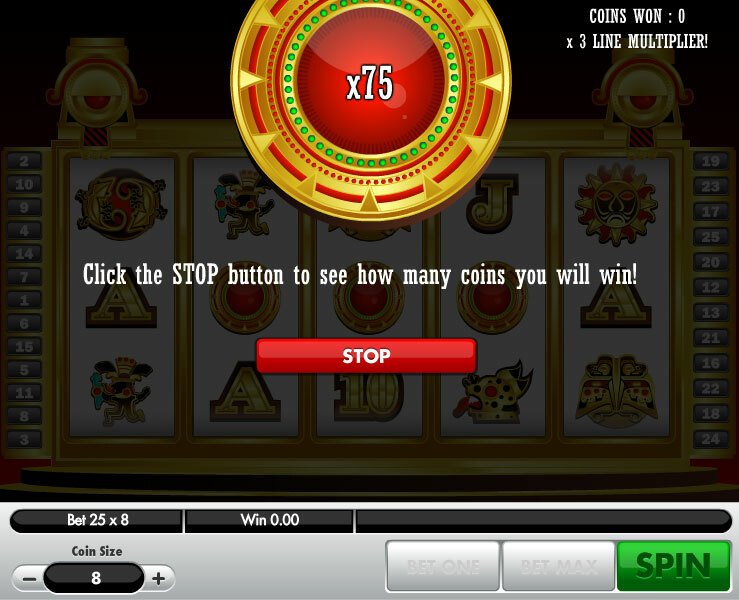 Various multiplier values will cycle through on the Red Eye, and when you hit Stop you get the one that will be applied to the total bet. This keeps happening until you get the Collect message. The game’s Coin Size is the option you see in the bottom left area. You can take it from the minimum of $0.01, to a maximum of $8. 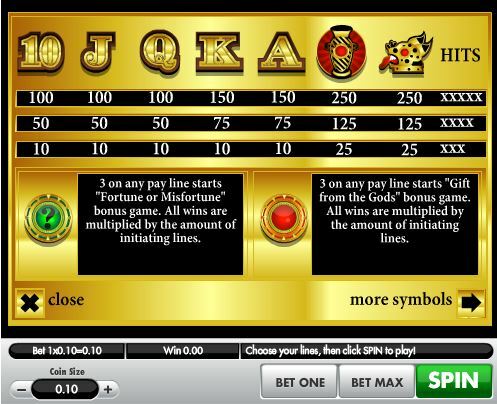 You can modify the number of active lines with the help of the Bet One and Bet Max buttons. When all 25 lines are active, you use up to $200 for one spin. The game rewards its players with 10,000 coins when the wild manages to create a five symbol combo. That’s up to $80,000 cash that you can take home. Though the game uses quite a bit of gold in its design, it manages not to overwhelm, so it’s a decent title to play. However, it’s not the kind of design that one would call impressive. It looks and feels like a slot machine with a few too many years behind it, no longer as impressive as it was originally. The gold color is used in pretty much all the symbols which appear in it, from the playing cards to the idols and even the pyramid logo. 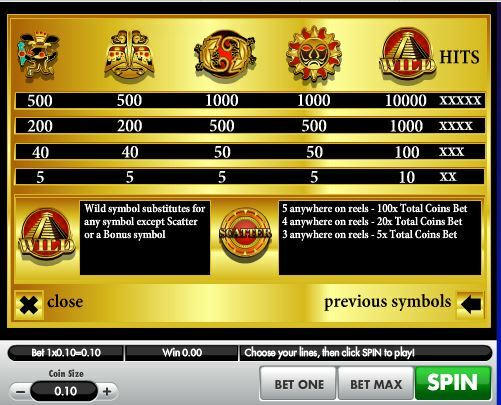 Symbols: Pyramid Wild (10,000 coins, wild), Scatter Logo (100x the bet, scatter), Green Eye (bonus), Red Eye (bonus), Sun (1,000 coins), Lizards (1,000 coins), Eagle (500 coins), King (500 coins), Leopard (250 coins), Ceramic Vessel (250 coins), Ace (150 coins), King (150 coins), Queen (100 coins), Jack (100 coins) & 10 (100 coins). It’s not easy to be impressed with this slot, as it doesn’t truly excel in any area, with the possible exception of the 10,000x jackpot. 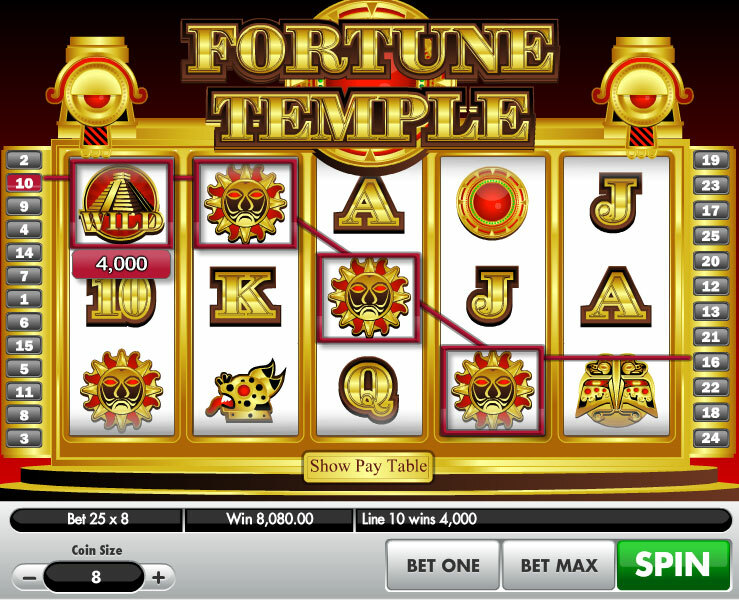 The Fortune Temple slot machine is offered through the Gamesys platform, so if you want to play it for real or just to practice, look out for casinos that use it.